I think this is the most awesome thing I’ve seen on the development on mobile. 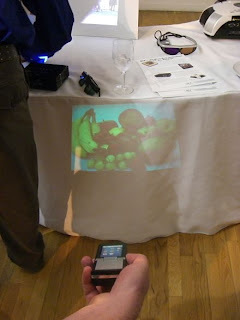 Popular Science and Engadget attended a press event in NY called Pepcom where Texas Instruments showed off their pico projector technology. The device will be able to create a 15 inch projection in a well lite room and shipping versions will use LED based technology to minimize heat and size. The quality and brightness of the proejction may not be optimized at the present moment which is probably why it has not been released into the market yet but I m sure it will gradually be improved and soon be commercially made available. It will be great add on to our mobile allowing us to share rich media content and even make a short presentation to others.